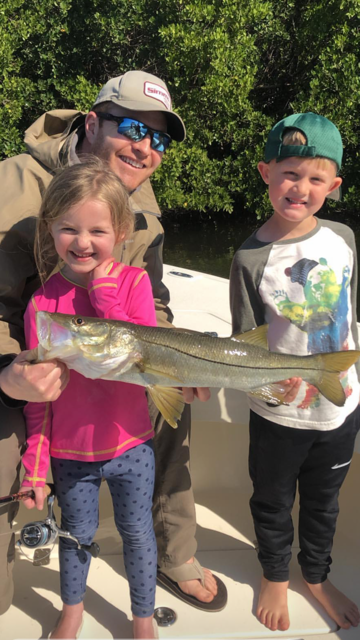 Spring break fishing charters 2019 in Saint Petersburg have been in full effect the past month aboard YACHTFISH Fishing Charters. The inshore fishing has been outstanding lately catching great numbers of Snook, Redfish and Trout in Tampa Bay. These fish are in a transitioning stage from their spring time hide outs to where they will reside all summer long. Once you find them it is not uncommon to catch 30-40 fish in a half day trip. We have also been targeting Kingfish, Sharks and Spanish Mackerel on our nearshore fishing charters with great results. The bite will remain very strong through the spring and summer as the bait migration continues. Farther offshore the Red grouper and Mangrove Snapper bite has been heating up. Also plenty of Amberjack and Blackfin Tuna around the wrecks and springs that can be caught on both live and artificial baits. Spring Break is Bringing Us Into Tarpon Fishing Season! Tarpon Season 2019 is right around the corner here in St. Petersburg. We have already started to see them show up in areas of Tampa Bay. Tarpon, affectionately known as Silver Kings, are one of the most popular inshore and nearshore fish in Florida to target during the spring and summer months. They are famous for acrobatic leaps and can jump up to ten feet out of the water while rattling their silver gills. It’s an unbelievable sight to see! Their scales are like silver dollars, and if you’re lucky, sometimes one will end up in the boat as a prized souvenir. The peak season for Tarpon fishing in Tampa Bay will be May through August for these giant silver kings and is booking up fast. Be sure to book well in advance to get the preferred tide and moon phase to make your Tarpon fishing dreams come true. YACHTFISH Fishing Charters out of St. Petersburg can be reached at 727.433.4200 to book your next fishing trip of a lifetime!